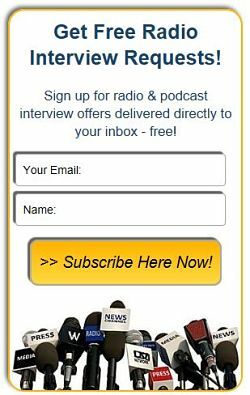 Featured Guest Expert Bonus Emails & Payment - Radio Guest List.com - How to Get Radio Interviews and Find Podcast Guests! Ready for some more interviews? Have the interview requests from your Featured Guest Expert placement slowed down? It's time to remind the RadioGuestList.com audience about your expertise! If you would like us to re-broadcast your Featured Guest Expert credentials to our worldwide email lists, we'd be happy to help. Repeated emails are the most cost-effective way to build a high publicity profile. It builds name recognition among our audience of radio show hosts and podcast producers by consistently reminding them of your interview availability. Note: These offers are only available to Featured Guest Experts with a currently active sponsorship subscription. If your placement has lapsed, please reinstate it now here before ordering more email blasts below. Have us promote your Featured Guest Expert listing to our worldwide audience again through online, email, and social media channels! This includes sending your entire page as a solo email blast to our "Show Hosts & Producers" email list again. This is an exclusive audience of 1800+ radio/TV show hosts, podcast bookers, and show producers. Not available anywhere else - this list is all bookers who have previously listed with our service looking for guests to interview so they want to hear from experts like you. For each bonus email you order we'll also post your Profile again on our blog, tweet it on Twitter, share it on Facebook, and include it as one of the listings in our Guest Request Email Newsletters to attract even more interview offers for you. Please just pick the number of blasts you want at right and click to pay. After payment, we will schedule your first new email blast within 2 weeks. We'll schedule your email blasts approximately 1 per month if you order more than one. Email us right after ordering if you have another schedule in mind for the followups to best fit your PR plans! orders of 3 or more! How many bonus email blasts? If you’d like MAXIMUM publicity, we allow 1 or 2 Featured Guest Expert email "Big Blasts" each month to our public general email list of 10,000+ subscribers. For each of these "Special Edition" bonus emails you order we'll also post your Profile again on our blog, tweet it on Twitter, share it on Facebook, and include it as one of the listings in our Guest Request Email Newsletters to attract even more interview offers for you. If you are currently a Featured Guest Expert advertiser, please just pick the number of blasts you want at right and click to pay. Sorry, no discounts on these exclusive promotional “Special Editions”. Want to provide your own graphic or ad text to email our audiences? Create your own custom message to reach our Show Hosts list for $179 per mailing and our "Big Blast" general audience for $199. Email us for details at ads @ radioguestlist.com. Ordering MORE email blasts will definitely help you get more interviews. Repeated exposure through ads and emails like these is the best way to attract more publicity interview bookings from busy show producers, hosts, and bookers! most response. So, with any of these orders, please allow up to 2 weeks before your 1st new email goes out. If you have an active Featured Guest Expert Subscription but would like us to update your page and emails by changing the copy, headlines, or photos, that costs much less than the original set-up fee. It's only $59. Please email us at ads @ radioguestlist.com with the changes you would like to make to your page and we will email you an invoice. Thank you for advertising with RadioGuestList.com!